The Legendary and renowned mobile manufacturing company BlackBerry has introduced its remarkable effort to the world, the BlackBerry Priv Smartphone which combines all features which you expect from BlackBerry with a bulk of apps and great experience of Android. the blackberry priv features 5.4” stunning dual-curved screen, AMOLED capacitive touch screen with 16M colors, enabled with multi-touch up to 10 fingers with screen resolution of 1440 x 2560 pixels (~540 ppi pixel density), having 71.9% screen-to-body ratio. The BlackBerry Priv has an ultra thin sleek design body, a hidden, smart slide bulging QWERTY keyboard, it embedded with a Nano-SIM slot and has a dimension of 147 x 77.2 x 9.4 mm (5.79 x 3.04 x 0.37 in), and it weighs only 192g. The BlackBerry Priv has a latest Platform of Android OS, Qualcomm 8992 Snapdragon 808 Hexa-Core, 64 bit and Adreno 418, 600MHz GPU. The Priv has built-in Flash memory of 32GB with 3GB RAM and expandable memory via hot swappable microSD memory card support up to 2TB. The BlackBerry Priv snaps with its gorgeous 18 megapixel auto-focus HDR camera which features optical image stabilization (OIS), Phase Detect Auto Focus (PDAF), Fast focus lock, 4X digital zoom, 4k Video Recording at 30 fps, 1080p HD video recording at 60 fps. 2 megapixel fixed-focus front camera features 720p HD video recording, 2X digital zoom, selfie Panorama, Multi-Frame Low Light Enhancement, Image & video stabilization. 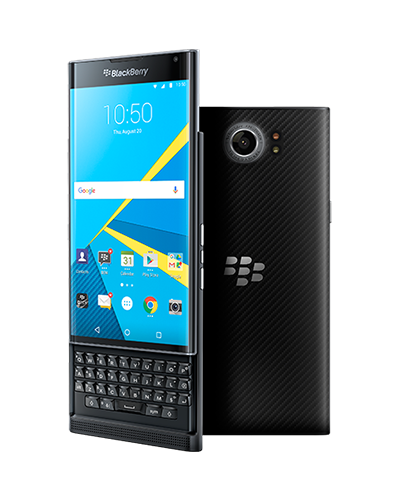 The Blackberry Priv embedded with 3410mAh non-removable lithium-ion powerful and effective battery which gives the long-lasting songs and video playbacks and a huge talk time of 24-hours at 3G, up to 730-hours of music play and 420-hours of stand-by time. The great BlackBerry Priv comes with its standard shining black color and this great Smartphone is available at the cost of only $399.99.